Orcs and humans may represent some of the most structured history we’ve got in Warcraft, but the draenei are by far the least explored. Introduced in Burning Crusade, this race of space-traveling eredar who avoided corruption by Sargeras has a story that spans back thousands upon thousands of years, longer than even the history of the night elves — and with far less definition. If you want a solid list of historical references and events that shape your character, playing a human, orc or even elf would probably suit you nicely. If you want a gigantic expanse of absolutely nothing that you can proceed to fill at your leisure, you might want to look at a draenei. Here’s the only real number we have, in terms of draenei history: 25,000 years ago. According to the old website for The Burning Crusade, that’s when Sargeras arrived on Argus to tempt the three leaders of the eredar — Kil’jaeden, Archimonde, and Velen. Yes, that Velen. We don’t know how old Velen was when this event occurred, but we do know that he was already one of three leaders of the eredar, so he definitely wasn’t a youth back then. And yet he’s still alive today in the Exodar. What does that tell you? Draenei are impossibly long lived. 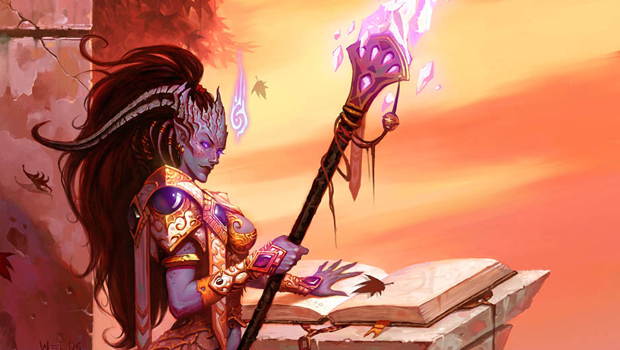 Unfortunately, while the RPG guides had suggested ages for nearly every race out there, the draenei were not one of those races included — they weren’t added to Warcraft‘s story until after the RPG books had ceased publication. As a roleplayer, you could look at this as a drawback, or look at it this from another angle altogether. We have no real, established answers for average draenei ages and life spans, so you’re free to pretty much make that number whatever you want. Want a 2,000 year old draenei who has seen several different worlds over the course of his life? Go ahead. Want to make a draenei who spends her days fondly remembering Argus, rivaling even Velen in age? Go ahead. There’s nothing out there to disprove any ages, really. In fact, by all appearances the draenei seem to be immortal. Lest you think this means they cannot be killed, remember that the draenei were slaughtered wholesale near the end of their stay on Draenor. They absolutely can die — but if left to their own devices, out of any apparent danger, it would appear that old age is simply not a concern at all. If Velen can live for over 25,000 years and still be the powerful prophetic presence that leads the draenei even now, who knows if draenei ever really get old, by their estimation? Who knows what that number really is? Who knows if age even matters to draenei at all? That’s what makes playing draenei characters really interesting, because your character is in constant contact with species whose entire lives begin and end in what would be considered almost a blink of an eye, an intake of breath to the long-lived draenei. Even the oldest of the known night elves are only a little over 10,000, which is still less than half Velen’s age. To a draenei, a human being that reaches adulthood at 16 or 18 must look like something really extraordinary, and the fact that most humans pass away by the time they hit 100 or so perhaps seems impossibly intriguing and maybe just a little sad as well. So when does a draenei reach maturity? If we go by the RPG guides for other long-lived races, they seem to indicate the longer-lived the race, the longer it takes to reach “full” adult status. Night elves theoretically reach maturity anywhere from 60-100 years of age, it’s not implausible to think that the draenei may follow similar rules. But again, we have no real references, not even references that were stricken from canon record here, so you’re pretty much free to play it as you wish. Here’s the deal with draenei history — what we know of the past 25,000 years for the draenei is very, very little. We know that they fled Argus with the naaru, and they arrived on Draenor roughly two to three hundred years ago, according to both the novel Rise of the Horde and Dave Kosak via Twitter. The span of history between these two events? It’s one gigantic blank canvas. The naaru taught the draenei how to use the Light, and the draenei moved from world to world, hounded by Kil’jaeden and the Burning Legion every step of the way until they found their way to a small, remote planet they named Draenor, or “Exile’s Refuge” in their own tongue. There, at last, it seems that they were safe and undetected. But Kil’jaeden not only found the draenei, he decided to bring about their destruction and give rise to an army the Legion could then command by tricking the native orcs and slowly corrupting the race, persuading them that the draenei were a dangerous threat, and basically beginning a war that led to wholesale slaughter. A gigantic chunk — over 80% — of the draenei were killed during the relentless attacks that took place all of 35 years or so ago. All draenei cities and temples were brought to ruin. And this is all painfully recent history for the draenei, who could only watch helplessly as their population was torn apart, shredded, and the planet they’d settled on shattered into chaos, strewn across the Twisting Nether, a horrific remnant of what it once was. The draenei who arrived on Azeroth were the survivors of what was building up to be the systematic extinction of their entire race. You know how the blood elves had to deal with the fact that a giant chunk of their population was wiped out by Scourge? 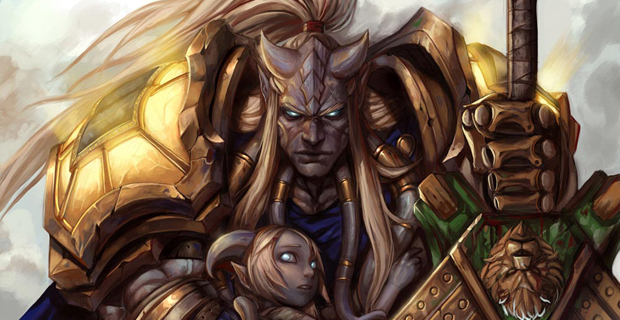 The draenei are their direct counterpart on the Alliance. For a race as long-lived as the draenei, the sudden confrontation with their species mortality had to have been a shock. The draenei, as evidenced by the Auchenai, hold great respect for their dead. And while the draenei had certainly fled many worlds before finally settling on Draenor, there was never this kind of loss to accompany their flight. Basically what you’re looking at when roleplaying a draenei character isn’t so much the sum of events or the history that makes up their lives — it’s how those events have shaped them into who they are today. And the largest of these events is without a doubt what happened on Draenor. Due to the sheer number of losses, it can be assumed that every single draenei that made it to the Exodar knew someone that died, more than a few, possibly friends, family, loved ones, even passing acquaintances. How did that shape who your draenei is? Are they angry, are they sad, are they stoic, are they hopeful, do they fight because they are afraid, or because they refuse to give up? And when you add in what happens in Warlords of Draenor, it hits even harder. Suddenly, those horrific atrocities they experienced such a short time ago have been brought back to life. Suddenly the people they thought were dead are now somehow alive. Suddenly Draenor is whole again, free of the demonic corruption. But these people are not your people, not quite. They haven’t experienced the raw, painful future you had to live through. They don’t recognize you — or if they do, they aren’t acting as if they know you. You are a stranger. You are a draenei, but you are … different, somehow. Harder. Stronger. You bear the mark of unbearable sorrow in the depths of your eyes, and they don’t quite know what to make of that, but they know that you fight with intense determination and resolve. You know why you do it — it’s because you cannot bear the thought of that future coming to pass on this world, too. It’s a lot of heavy, emotional material to work through … but just because the draenei of Azeroth have lived through immeasurable sorrow, it doesn’t mean that your character has to be in a constant state of distress. The draenei may have experienced horrific atrocities, but they also possess immeasurable strength. Hope. They carry the Light with them, and a spark of stubborn survival that will not allow them to falter, not even when the future seems bleak and unforgiving. Above all else, they are survivors. They endure, and they take joy in the world around them — a lifetime of exploring and discovering new worlds has no doubt shown them there is just as much to treasure in the universe as there is to fight against. As with the orcs we discussed last week, it’s entirely possible to create a draenei character that presumably grew up on the AU version of Draenor. 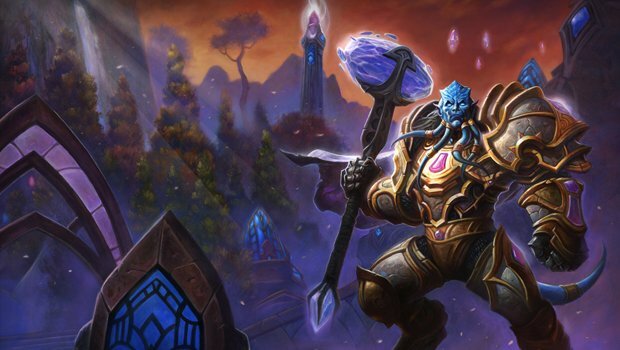 There’s one major difference between the draenei that live on Draenor right now and those from Azeroth, a big one — they haven’t lived through the terrible times that Azeroth draenei experienced, not yet. They didn’t witness the fel corruption of the orcs, the destruction of the planet that they love, the deaths of so many of their kin and loved ones. For them, none of this has come to pass. If this sounds like something you’re interested in trying out, take a look at the article I wrote about the subject a few weeks ago, it should be helpful.